You may have seen hummer limos driving around the streets of Miami, Fort Lauderdale, and West Palm Beach Florida at night. We’ll bet you even stopped and stared in awe, wishing for a moment it was you. We don’t blame you; a 20 plus person hummer limousine touring Miami from South Beach to Little Havana, while all 4 subwoofers of its 4500 watt sound system are working to create a rumbling in the core of your being, is really hard to ignore or blame. 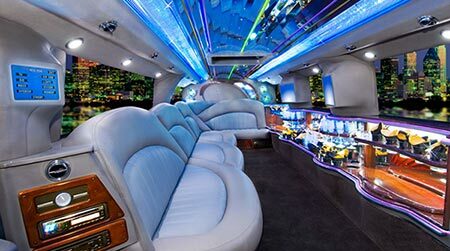 6-10 flat screen TVs (with a Playstation 2), the sound system mentioned earlier (which also includes 12 12″ speakers), neon lighting, a wet bar area with 18 crystal glasses, dual A/C units, 4 lava lamps, a noise activated laser show, and all the fun you can stand during your limousine extravaganza. “Well, I bet you are saying this all sounds to good to be true,” aren’t you? “But what use do I have for this perfect union of marriage, technology and style”? Well how about taking a ride in a limo in style on you next wedding anniversary? Better yet, your ten year, twenty year, and fifty year anniversary with just a pinch of good old fashioned American desire”. After all we all deserve to be pampered with the luxury limobus, Escalade, or Hummer at least once in our life. Hit South Beach Miami, and any other local club that might strike you as you get from A to B and beyond in the comfort of your own rented south florida hummer limousine. – Make that special event that so much more memorable by choosing to arrive in the largest hummer limo anyone has ever seen. Rent hummer limos in Ft. Lauderdale Florida for Proms, weddings, anniversaries, Bar Mitzvahs or whatever other special event you have in mind. After all, arriving in the Hummer limousine can only enhance the experience that much more. – Launch an attack against a small, unsuspecting nation of your friends by surprising them when you pull in their driveways. I bet you could have fun with that last one, but be sure to be friendly. Even so, keeping all this in mind, just imagine slowly cruising down Flagler Street or 441, University Drive, A1A in one of these mobile monuments that are mammoth in size. We bet you will be the envy of all who gaze upon you riding the streets of miami or west palm beach and don’t forget your friends as you have the time of your life. What better way to experience Miami than in a hummer limo from South Florida Transporation?